Scientific organizations have lagged behind the dynamic changes that have occurred in other businesses. 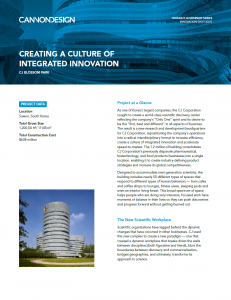 CJ used their headquarters to create a new paradigm — one that created a dynamic workplace that breaks down the walls between disciplines (both figurative and literal), blurs the boundaries between discovery and commercialization, bridges geographies, and ultimately, transforms its approach to science. The design of CJ Blossom Park is founded on the “New Scientific Workplace” concept — a radical design approach that replaces traditional laboratory planning ideas with integrated innovation strategies to create dynamic, boundary-less environments that increase productivity, efficiency and creativity. This was vital for the organization, especially as it brought together all of its disparate business entities into one central location. This paper breaks down each of these identifiers and proves why CJ Blossom Park is a true testament to this new paradigm of the scientific workplace.